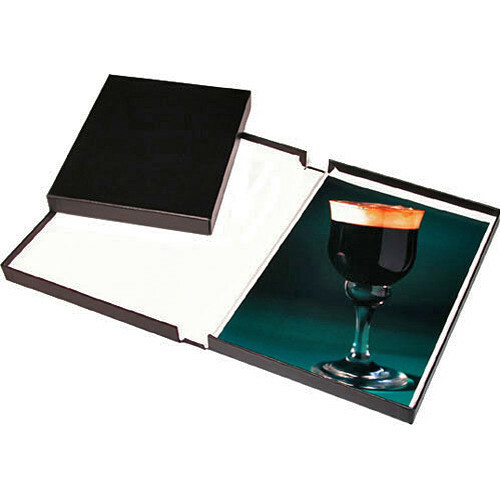 This PrintFile 17x22" Clamshell Portfolio Box is attractive enough for gallery presentation with the added benefit of archival construction which meets rigorous museum standards for long-term conservation. The top and bottom of the white-lined box remain flat when opened, making stacking or displaying prints or mounted materials easy and safe. Top and bottom remain flat when opened, allowing easy access to contents. Passes PAT-safe for long term storage. Features attractive black buckram exterior. Made from 0.098 heavyweight binders board. Buffered, acid-free and lignin-free black paper interior lining. Neutral Ph adhesive used in box construction. Sized for the most popular print formats. Box Dimensions (LxWxH) 23.0 x 18.0 x 2.0"